Baked Teriyaki Chicken that’s crispy and caramelized in the oven with just five minutes of prep time and homemade teriyaki sauce. 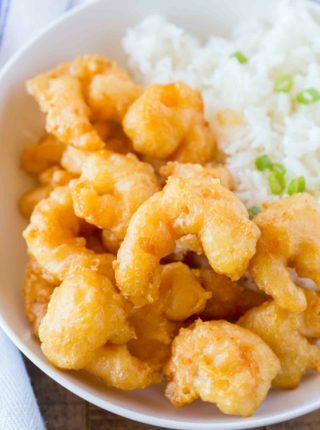 We love classic Asian dishes like Shrimp Tempura, Chicken Pad Thai and General Tso’s Chicken. 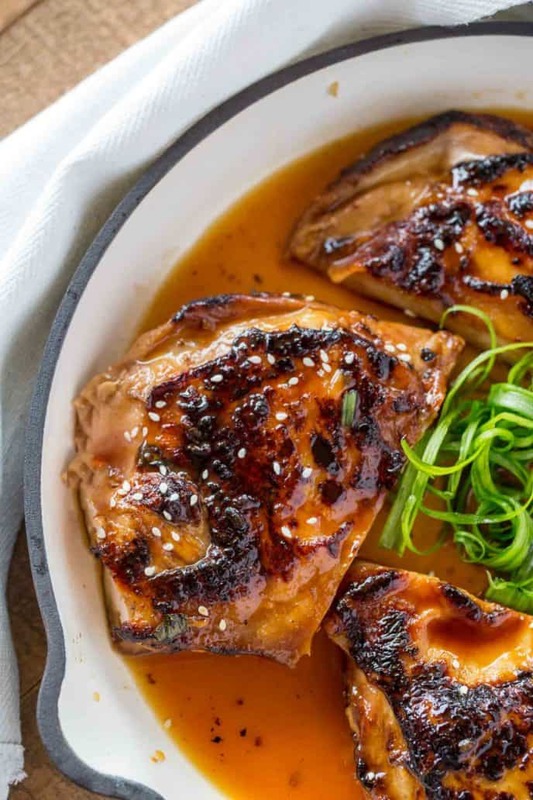 Teriyaki Chicken doesn’t have to mean a store-bought marinade with ingredients you don’t know or just a takeout option. I am willing to wager if you’ve ever made any Asian recipes in the past you’ve got all the ingredients you need for this dish. It’s as complicated as soy sauce and rice vinegar. Plus since we are baking this chicken teriyaki you don’t even have to stand over the stovetop searing off tiny pieces of chicken breast or thigh meat and hoping your sauce doesn’t burn. Did I mention this teriyaki chicken was one pot? We make and thicken the sauce in the same skillet as the chicken is going to bake so just be sure you’re using an oven-safe skillet when you start the sauce. I use my coated cast iron skillets that I love, but any oven safe skillet will work. 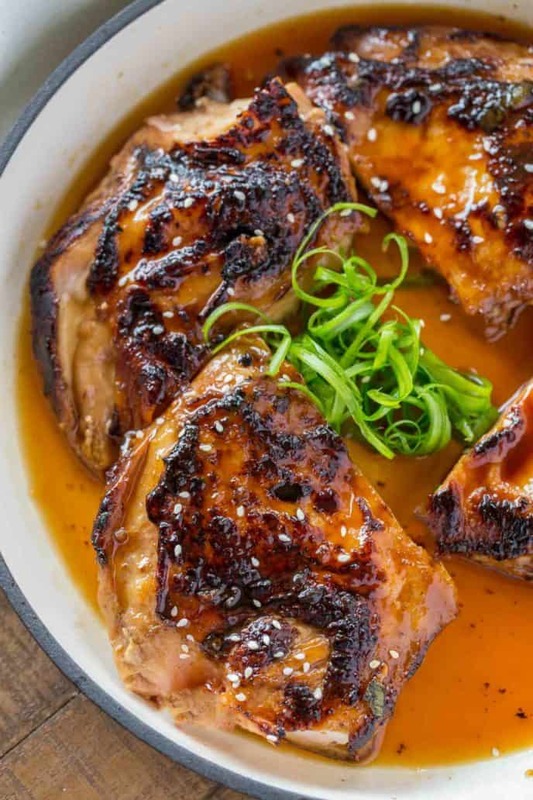 I use skin on and bone in chicken for this recipe but you can use boneless skinless chicken thighs as well. I’m just a sucker for a great baked chicken thigh. Teriyaki Sauce is pretty simple to make. It’s a mixture of soy sauce, rice vinegar, sugar, cornstarch, ginger and garlic thickened slightly before baking. To make things simple I use garlic powder and ground ginger but using fresh is even more flavorful and delicious! You can use the sauce in a stir-fry or with noodles like in this Ground Beef Teriyaki Ramen. How do you make teriyaki chicken stir fry? Use boneless and skinless chicken thighs and cut them into 1 inch cubes. Add a small amount of canola oil to the pan on medium high heat. Saute the chicken thighs on both sides before removing from the pan. Add all the chicken pieces back into the pan with the ingredients for the teriyaki sauce and allow the chicken thighs to finish cooking in the pan as the sauce reduces and thickens. If you’d like to grill this teriyaki chicken you can make easy adjustments and have an easy summer dinner. Add the ingredients to a container with the pieces of chicken and marinade overnight. Remove the chicken and let the marinade drip off before adding it to the grill. Cook the chicken on the grill and pour the marinade into a medium sized saucepan to bring it to a boil. After the sauce has cooked down and thickened use a clean brush or spoon to glaze the chicken on the grill lightly. Serve with extra sauce on the side or on top. You can also make this recipe in the slow cooker, I have a Slow Cooker Teriyaki Chicken too! 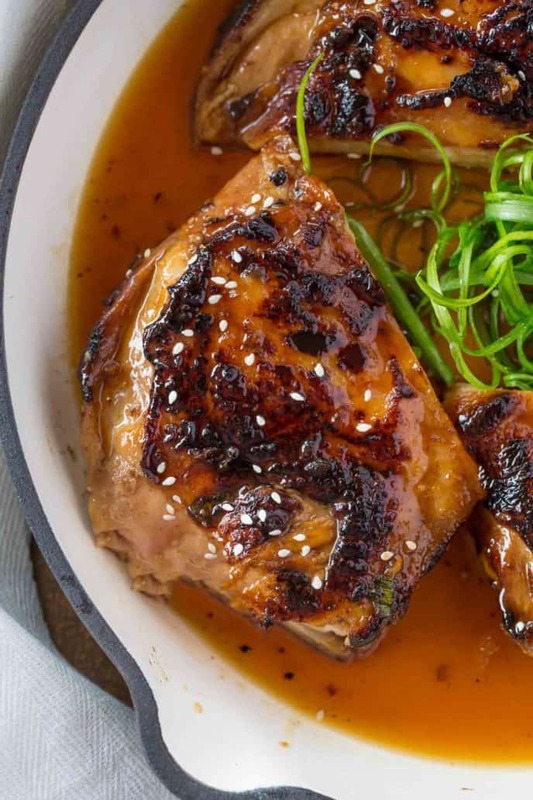 What to serve with teriyaki chicken? 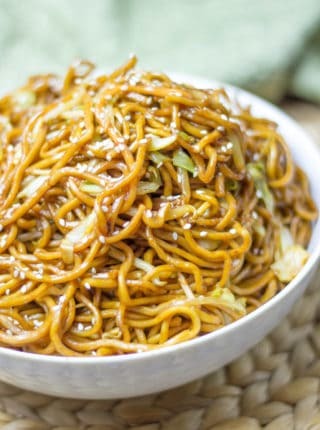 We love Chow Mein, brown rice or Fried Rice and steamed broccoli or other simple Roasted Vegetables. You can also make your dish look pretty with a couple of easy garnishes. First, I pretty much love sprinkling sesame seeds on any Asian dish that makes sense. It adds color and instant fancy to the dish. Second I love using green onions as a garnish because they’re fresh and delicious and work well with Asian recipes. Slice them thinly from root to tip. I love using both the white and green parts of the green onion. The white parts have a stronger flavor than the green parts but both are equally delicious. Slice them thinly on an angle for a fancier presentation. Gift Wrap ribbon method when you use a knife and cut the green onions very thinly on an angle (long angle so its almost 2-3 inches long) and add it to ice water for 30 minutes. This makes green onions super curly. 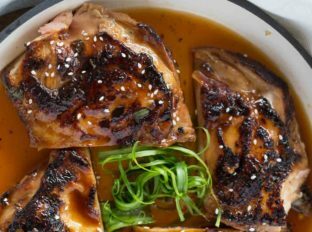 Baked Teriyaki Chicken that's crispy and caramelized in the oven with just five minutes of prep time. 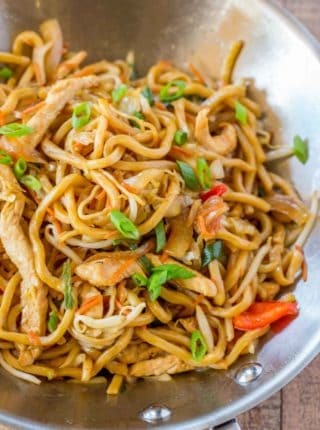 In a large skillet whisk together the cornstarch, sugar, soy sauce, vinegar, garlic, ginger then turn on the heat to medium and continue whisking until the sauce thickens (about 3-4 minutes). Add the chicken thighs skin side down, move the pan to the oven, cook for 30 minutes then turn over and cook for an additional 15 minutes. Not sure if I’m misreading this recipe but when does the oven part comes in? I’ve edited it to read more clearly. Thanks for letting me know. I made this and it was great! I want to try it with boneless skinless and just wanted to know if I should adjust the cook time at all? I’m so glad you enjoyed it! If you decide to use boneless, I would suggest cutting back your oven cooking time to 30 minutes total (turning them over around the 15 min mark). Hope this helps! Excellent recipe! Simple to make and we loved it! It’ll be in regular rotation at our house! So glad you enjoyed it, Cheryl! Looks delicious! 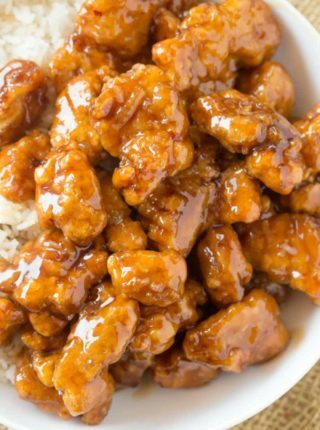 I love teriyaki! YUM!! This looks absolutely delicious!! Can’t wait to try it!! One of my favorites!!! So good! I’m ALL for anything teriyaki!! This looks to die for!! Making ASAP! I bet this would be a great recipe to teach my son for his first college apartment!